L2L students outperform non L2L on academic achievement measures. L2L students using L2L 45 minutes per week (3 lessons) experienced on average a gain of 83 points from fall to spring, compared to non-L2L students who gained 50 points. L2L students scored 71 points higher on DIBELS Composite Scores compared to non-L2L students. On average L2L students were 53 points higher at the end of the school year compared to non L2L students. 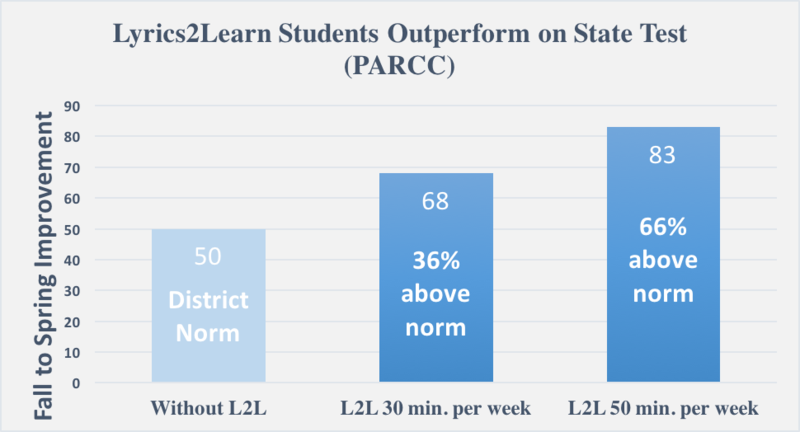 Students who are participating in L2L generally are scoring significantly higher on the CMAS/PARCC than those students who are not. Students who are not in L2L had an average score of 698 compared to students participating in L2L with a score of 768. 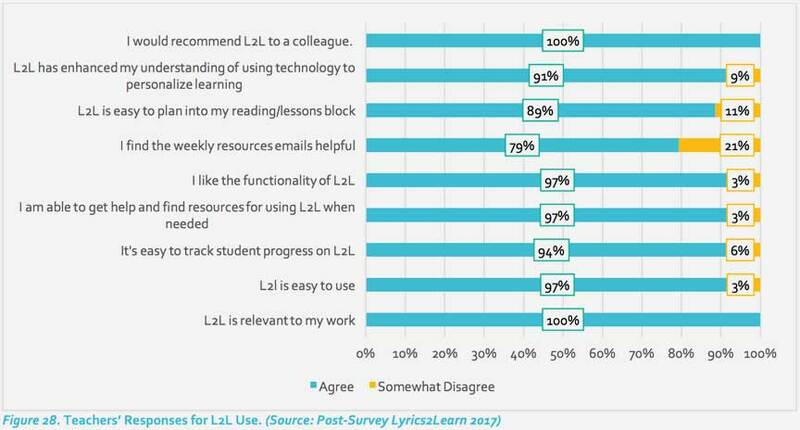 100% of L2L teachers in the current study would recommend L2L to a colleague. 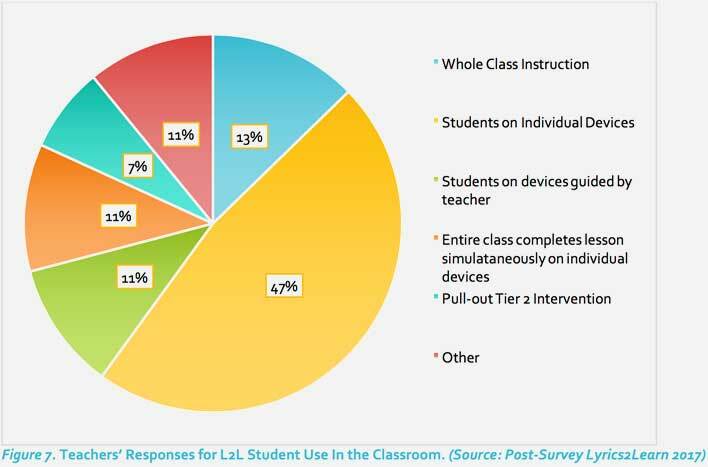 97% of L2L teachers in the current study report that their students are engaged when using L2L. 94% of L2L teachers in the current study report that their students are motivated to slearn when using L2L. "I think that this is the best program I have used in my 17 years of teaching." "I like that it is so user friendly and that students are so engaged...as a busy teacher...it is easy for me to check the progress and hold kids accountable. I like that students can be engaged in an effective program that provides them with relevant practice instead of worksheets or seat work." L2L is designed to be used towards helping students with reading fluency, and comprehension, background knowledge, and test-taking skills. L2L was administered in many ways. The program is designed to be used by students at least three times per week to achieve maximum results. Teacher perceptions on L2L were captured in the spring survey over a series of questions. Overall, all teachers reported that L2L is relevant to the work that they do, L2L is easy to use, and they would recommend L2L to a colleague. Data included in subsequent analyses includes only those students for whom academic outcome data was provided. Because L2L students are not consistently reported across academic outcome datasets, statistics in the following section will be sourced from the Galileo dataset because it has more students captured in these fields. 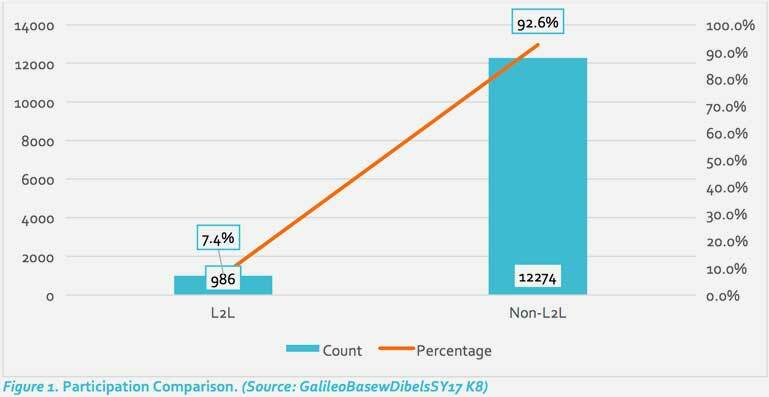 The Galileo dataset include a total of 13,260 students, 986 of which are identified as L2L participants. The breakdown of student participation can be found in Figure 1 below. 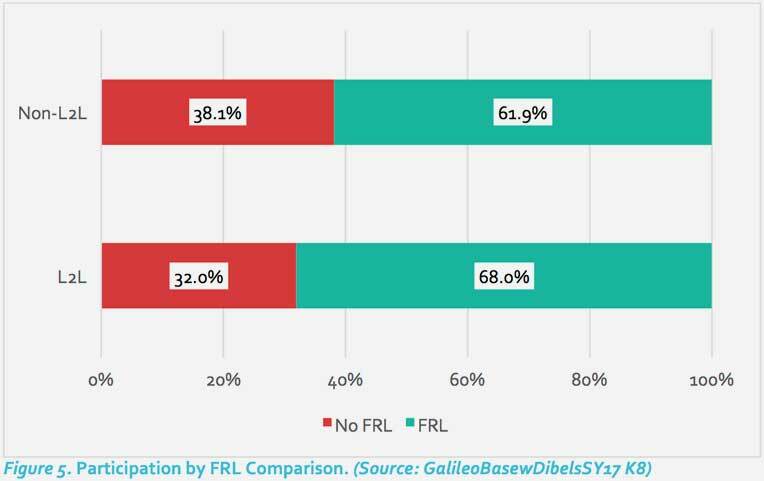 The gender breakdown of L2L students is similar to the gender breakdown of non-L2L students. 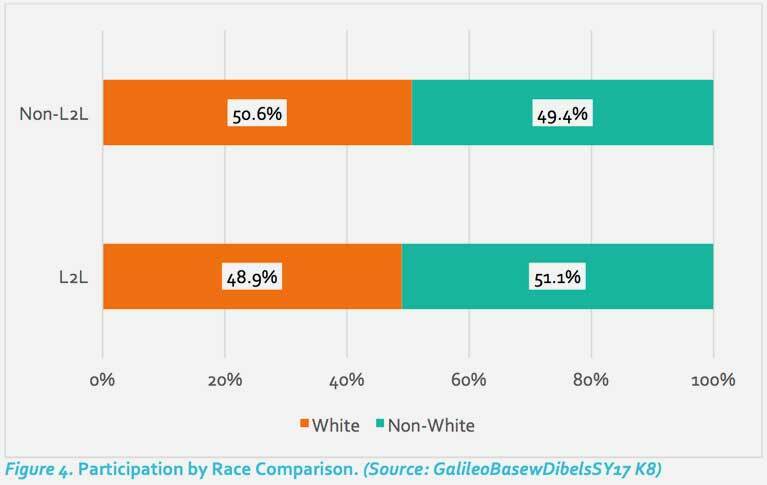 The sample of students from the district did not include a breakdown of specific student identified races, rather included a binary of those who are considered white and other or "minority". Again, the distribution of students compared on this category are very similar. Unlike the previous characteristics, there is a higher percentage of L2L students receiving free and reduced lunch than comparison students. 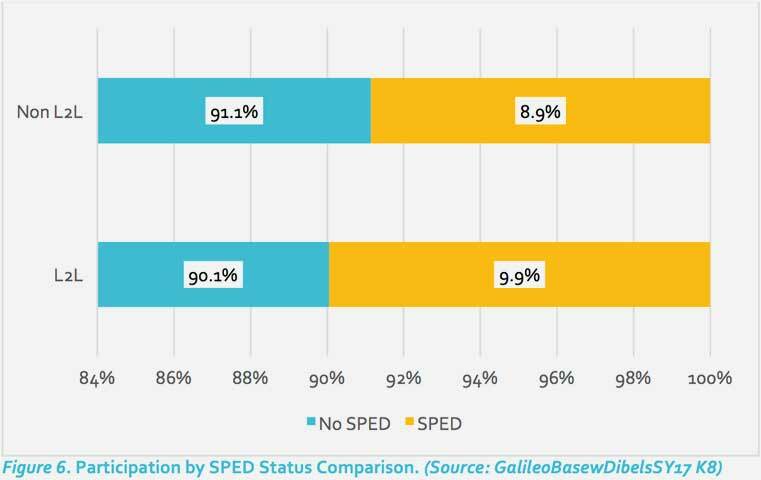 The percentage of students participating in SPED and L2L is similar to the percentage not participating in L2L. To gain a better understanding of the impact of usage of L2L on scores for students, students were split into comparison groups based on usage. The comparison groups were those who did not participate in L2L compared to those who completed 100+ lessons (3 or more per week/45 minutes or more). The difference in average pre and post scores on the CMAS/PARCC increases as L2L lesson use increased. Students completing 100 or more lessons over the school year experienced on average a gain of 83 points from fall 2016 to spring 2017, compared to non-L2L students who gained 50 points, a 66% greater improvement on their state assessment. Lyrics2Learn is available for classrooms, schools and districts. Contact us to discuss how Lefty can help your students.